UK unemployment not following Mr Carney's script? 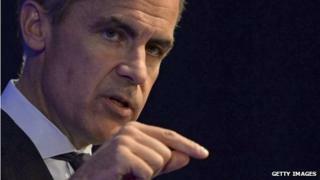 Mark Carney has been keen to link movements in UK interest rates to falls in unemployment. Apparently many investors want to do the same with the exchange rate. News of a fall in the level of joblessness has pushed up the value of the pound to its highest level against the dollar since the spring. Apparently, people in the markets think the jobs data provides more reason to expect official interest rates to go up before 2016, the date that is currently pencilled in by the Bank's policy-makers. With UK economic data now improving so rapidly, that is certainly possible. But if we do see unemployment fall faster than the Bank of England now expects, we must all hope that it comes from surprisingly strong demand across the economy, not weaker than expected supply. How surprising are today's labour market figures? If the response of city economists is anything to go by, the answer is "not very". Economists at Goldman Sachs and Barclays have said they are strong, but in line with their forecasts. Like the Bank, they expect unemployment to fall only slowly between now and 2016, reaching 7% only in 2016 (if then). It's certainly worth keeping the 0.1 percentage point fall in the headline unemployment rate in perspective. Though 7.7% is 0.4 percentage points lower than a year ago, it's no different from what it was last November. The employment ratio, at 71.6%, is also the same as it was in that month. That is higher than it has been for most of the past 4 years, but still some way off the 73% recorded at the start of 2008. We have a record number in work, but that is not unrelated to the fact that our population is also at a 'record high'. So, the Bank might not be tearing up its unemployment forecasts just yet. But the numbers from the broader economy have been so much better than anyone expected the past few months, you have to assume they will be thinking about revising up their growth forecasts for this year - and probably next year as well. That might well have knock-on effects for unemployment, even if the Bank and others are right that employers have ample room to boost output without raising employment. The Office for Budget Responsibility is one institution that will be changing its figures in light of all this good news. At the time of the Budget it was assuming that the broader ILO measure of unemployment would be unchanged over the course of 2013, at 7.9%, rising to 8% in 2014, only falling significantly below 7% in 2017. For the Bank of England, the key issue for policy is not just what happens to unemployment over the next few years, but why. The best possible outcome is for Britain's GDP, employment and productivity (output per head) to all grow strongly from here on in. That is not impossible. But there aren't many in the city who would say it was the most likely outcome. The "experts" almost always underestimate the strength of recoveries, once they get going. There's no reason to think it won't happen this time as well, even if we have waited a long time to be surprised. If so, the Bank's forward guidance will not stand the way of bank rate going up in 2015, as many in the markets now expect. However, the Bank's new framework also allows for a much bleaker possibility, that output and employment go up, but productivity does not - meaning that the long-term potential of our economy really has been seriously undermined by the events of the past decade. That might also mean an earlier than expected rise in interest rates. But it's not a prospect that any of us are likely to welcome. As things stand, the run of recent data suggests that UK unemployment might fall a little faster than the Bank of England expects, not because of surprisingly bad news from the supply side of the economy, but thanks to the sheer strength of output and demand. That would be good news indeed. But, as Vince Cable would say, it's early days yet.